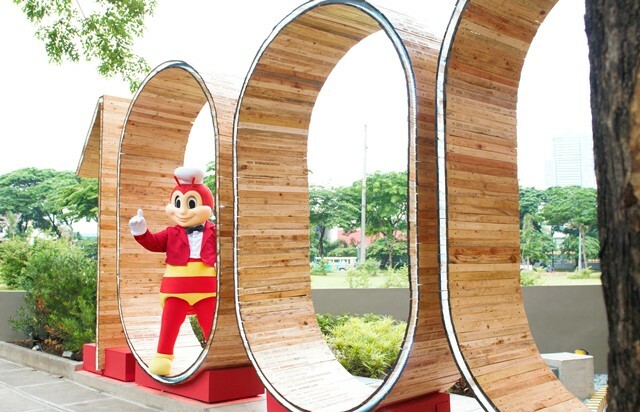 Lemon GreenTea: A festive celebration marks the opening of Jollibee’s 1000th store! A festive celebration marks the opening of Jollibee’s 1000th store! Jollibee Philippines President JJ Alano (10th from left) led the milestone store’s unveiling. Also in the photo are (from left) Jollibee National Business Channels Head Manuel Yap, North Luzon Regional Business Unit (RBU) Head Lines Briones, Visayas RBU Head Winston Sia, South Luzon RBU Head Bambi Bejo, Metro North RBU Head Mike Castro, Mindanao RBU Head Ana Aluyen, Metro South RBU Head Rose Caalam, Restaurant Systems Head Jon Villanueva, Research and Development Head Edna Barin, HR Head George Wang III, Franchising Head Kay So, Marketing Head Francis Flores, and Finance Head Cynthia Castro. MILLIONS SERVED, COUNTLESS JOYS. Jollibee Philippines President JJ Alano thanks Filipinos for being part of Jollibee’s journey to its first thousand stores in his opening remarks. A TOAST TO JOY AND GREAT PARTNERSHIPS. 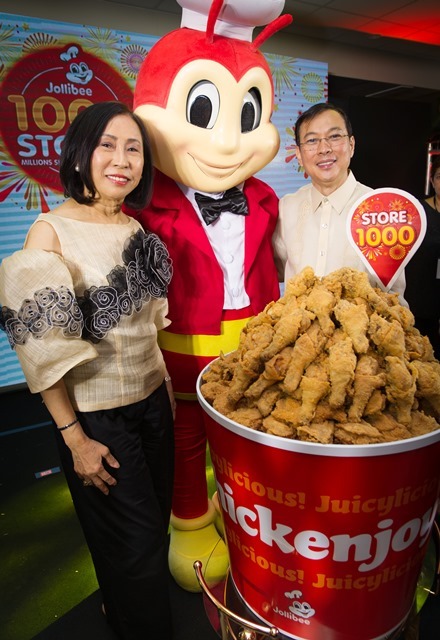 Jollibee Foods Corporation Chairman Tony Tan Caktiong and Jollibee Group Foundation President Grace Tan Caktiong celebrate the 1000th store milestone with the ceremonial Chickenjoy Toast. A JOLLY THANK YOU. Jollibee Foods Corporation Chairman Tony Tan Caktiong and Jollibee Group Foundation President Grace Tan Caktiong hand over the ceremonial check to farmers Rowell Lopez of Ilocos Sur and Lawrence Catabay of Pangasinan. The two are members of Jollibee’s Farmer Entrepreneurship Program, which stands to benefit from the P10-million worth of technical and financial assistance Jollibee has earmarked for its farmer partners. The 1000th store landmark. Jollibee BGC Triangle Drive’s wooden landmark bears the names of all Jollibee branches nationwide, from the first to the 999th. Standing in front of the milestone landmark are Jollibee National Business Channels Head Manuel Yap, Visayas RBU Head, Research and Development Head Edna Barin, Franchising Head Kay So, North Luzon RHU Head Lines Briones, brand ambassador Anne Curtis, Jollibee, Finance Head Cynthia Castro, Mindanao RBU Head Ana Aluyen, South Luzon RBU Head Bambi Bejo, and Marketing Head Francis Flores.